» Bingo System: Taito throws in the classic game of Bingo where a 3x3 grid is lit up during the course of a stage as invaders are shot. To win at Bingo, key spots on the grid must light up horizontally, vertically, or diagonally. » Multiplayer WiFi Mode: Compete against another player via wireless Wi-Fi connection with new strategic considerations. The weapons are the same as the original SIE with the blue laser cleaving through waves of enemies, the bomb-shot causing multiple explosions, and the broad shot hitting multiple enemies at once. 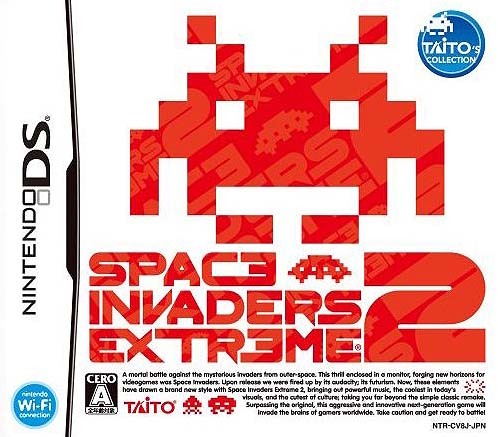 Both screens of the NDS are used where the top screen features Bingo or UFOs and boss invaders alternately while the touch screen contains the standard waves of invader forces. Japanese NDS games may be played on North American and European NDS handhelds. There is no region-coding on Nintendo DS game cards.